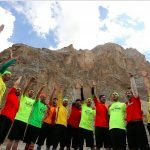 SHIMSHAL: A weeklong basic mountaineering camp organized by Pakistan Youth Outreach in collaboration with Karakorum Expedition, came to its end. This year marked successful conclusion of 6th Basic Mountaineering and 2nd National Ice Climbing championship at Malangudi Glacier Shimshal. For the past six years, Pakistan Youth Outreach has been organizing outdoor sports related events for youth. The outdoor mountaineering training camp is initiative of mountaineering duo siblings, Ms. Samina Baig and Mr. Mirza Ali, as a part of wider youth outreach program. 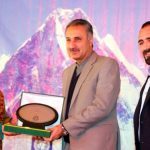 In particular, the purpose of this event is to promote outdoor sports, encourage women participation in challenging adventure sports and promote tourism specially winter & adventure tourism in Pakistan. The event had around 25 participants, representing different regions of Pakistan, from Sindh, Punjab, PATA (swat), AJK and Gilgit Baltistan. Out of total 25 members, there were 13 girls from different professions and of age group between 17 to 48 years. This year’s event also had three foreign participants, two females and a male from Norway, USA and Germany respectively. The weeklong mountaineering camp concluded with the 2nd National Ice Climbing Competition. The initial plan was for the championship to be held at the Pakistan’s first artificial wall, however due to global warming affecting Shimshal’s winter this year the wall couldn’t be built. The championship was therefore held at the foot of Malangudi Glacier’s natural ice wall. The Championship is a promotion of winter Olympics in Pakistan and engaging youth in healthy activities. The competition was divided into two categories for girls and boys. After a thrilling competition, under boys category Mr. Sultan Mirza age 17 secured the first position, 1st National ice champion Mr. Ahmed Baig came to 2nd place and Mr. Reco from Germany secured 3rd position. In a compelling competition among girls, Ms. Siv Ann secured 1st position, 1st National Ice climbing Champion Ms. Samana Rahim secured 2nd position and Ms.Maira Wafa held 3rd position. The full day championship was followed by an award distribution ceremony, which was a perfect way to end the event, with winners being awarded with unique prizes of ice climbing tools. Mr. Reco, Mr. Kalim swaty highly appreciated PYO for organizing such events for the youth of Pakistan and hoped for this to continue in future. Mr. Saleem an engineer by profession also commended the event and showed his eagerness to join similar events in the future. Ms. Natasha and Zoya from Sindh also expressed their gratitude and thanked Mr. Mirza Ali and Ms. Samina Baig for organizing such a wonderful event. The event came to a great end and all the participants greatly enjoyed their time & learning experience, and happily returned home after spending a night in Shimshal village. The basic mountaineering camp was an inspiration and motivation for the young participants, as it taught them not only the basic climbing techniques, but also unique survival skills and provided a great platform for social interaction. Ms.Samina and Mr.Mirza Ali highly appreciated the participants for their courage, interest and enthusiasm for outdoor sports and appreciated participants’ families for allowing and trusting PYO to send their children in this outdoor camp specially in case of young girls. This was indeed a great message of women empowerment and gender equality. Pakistan Youth outreach will continue to organize similar events in the future for youth with same objectives. Pakistan Youth outreach next event is Ski4Freedom starting from 20th -27th January and first ski event in Chipursan valley from 1st till 4th February.